Chapter 9 on Weight Transfer alone is worth the price of the book. The book is written with much technical discussion but not so much that you can’t grasp the concepts and be ready to apply them. Don’t be scared folks, there’s nothing more than algebra, trig, and geometry here. No differential equations or calculus! Alan takes us carefully through the concept that some find hard to grasp, which is that spring rates generally have no primary effect on side to side weight transfer. He describes how it’s all in the configuration of the car i.e. track width, center of gravity height, and the geometry of the suspension links. 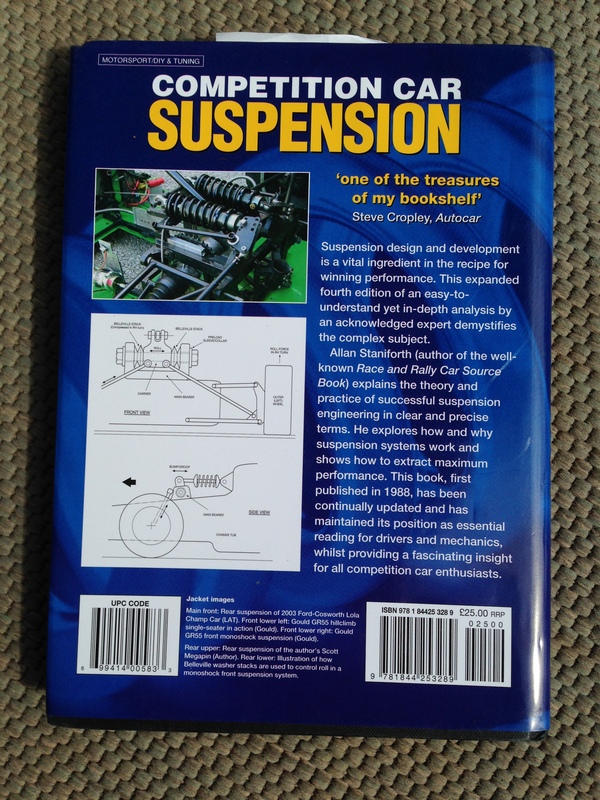 After I finished this book, I was able to go back to Chapter 9 and use the step by step equations presented to build an Excel spreadsheet that I use to evaluate the suspension on my racecar. This spreadsheet has been very useful to me. 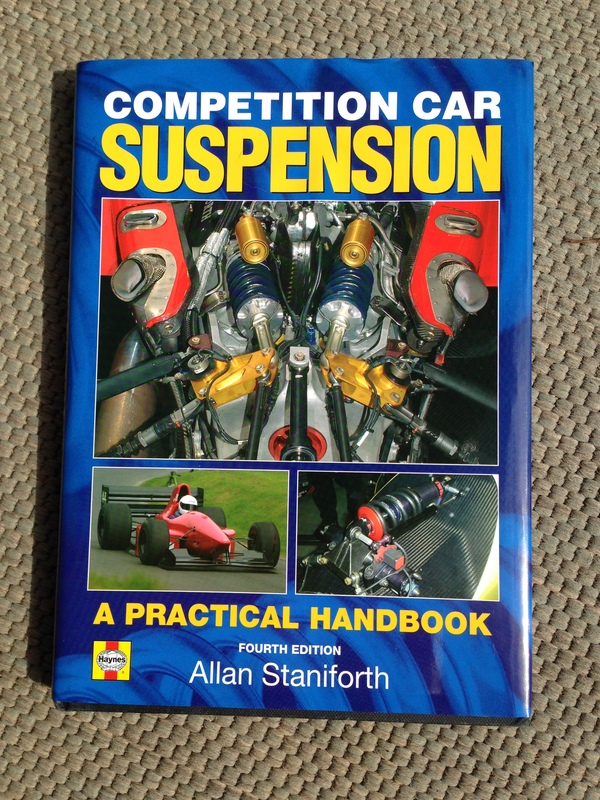 The book also has a very good chapter on Dampers and Monoshocks e.g. shock absorbers. This is another of those intimidating areas of suspension design that Alan does a good job of explaining. In summary, as stated on the back cover “One of the treasures on my bookshelf” Steve Copley, Autocar. I couldn’t agree more. Comment: I was careful to say this is the one text that I would put on the top of my list. Since I originally read this book, I discovered the excellent web tutorial “Autocross to Win” authored by Dennis Grant at the Far North Racing website. (See http://farnorthracing.com/autocross_secrets.html). In my humble opinion, Dennis has done an outstanding job of pulling together many varied concepts including suspension design and much more to help you understand how to make your car go faster. This site is currently at the top of my list when I’m ask to recommend to someone a way to learn about suspension design. Don’t let the title mislead you, the concepts presented apply equally to the street, autocross, and road courses. Check it out!